Certified product seals begin to appear on grocers’ shelves, a modest first step in an education campaign to extol the technology’s benefits and head off naysayers. Once bitten, twice shy may sum up food companies’ approach to consumer communications regarding pasteurization with high-pressure processing technology. More than a few scientific advancements (think GMOs and irradiation) have encountered strong headwinds and public backlash. While some food marketers are willing to make the case for HPP pasteurization, others avoid any discussion. Exhibit A is Hormel Foods, likely the world’s biggest user of the technology. Cleaner labels are the only evidence of the technology’s use on products like Natural Choice deli meats and Butterball turkey products. Hormel’s approach has worked well for almost two decades, but some proponents of HPP technology believe transparency and public education is the best approach. Making the public case for HPP is the goal of the Cold Pressure Council, an industry group formed last year, with creation of the Cold Pressure Certified seal the visible symbol of that effort. Hormel studiously avoids any mention of HPP out of concern that it would cast Hormel products that do not undergo the treatment in a negative light. The first products bearing the seal started turning up on retail shelves in March. Evolution Fresh juices included it along with USDA Organic and Non-GMO Project Verified logos. The Starbucks subsidiary makes a point of describing its juices as “cold-pressed,” using the term three other times on the label, once in text directing people to coldpressure.org to learn more about HPP. That URL redirects to the website of the Cold Pressure Council (coldpressurecouncil.org), which launched in March 2017 with a mission to promote application standards and consumer awareness. The certification effort is in its early stages, and consumer education is in its infancy. “We are just now beginning social media awareness,” says Jeff Williams, council chairman. “It’s going to be a gradual evolution to build understanding of the consumer benefits, and it’s going to take a lot of time and effort.” Most of the heavy lifting necessarily will have to be done by brand owners, he adds. Aronson recently opened Great Lakes HPP Food Innovation Center, a tolling operation in a 40,000-sq.-ft. Taylor, Mich., facility, with an option to purchase 250,000 sq. ft. of additional space. An early customer is Drought, a raw juicing operation that is able to extend shelf life from three days to 40 with HPP, according to Aronson. A decade ago, Bruhn and Claudia Delgado-Gutierrez polled health professionals about awareness and attitudes toward novel technologies, including HPP and irradiation. Awareness of food-safety interventions like irradiation hovered around one-third, but two-thirds already were aware of HPP. Enhanced product safety was the primary appeal for professionals, but better nutrition and flavor were the benefits that would induce consumers to pay a premium for a treated product. Higher retail prices, along with some people’s aversion to processed food and technology in general, are likely to be points of public resistance. Juicing proponents may take exception to appropriation of the term cold pressed by products that aren’t raw but rather pasteurized. Labeling HPP “cold pressure” may be nonthreatening, but it hardly counts as a benefit. And extolling the safety benefits would cast a shadow on thermally pasteurized products, just as the politician who touts his or her patriotism or tough-on-crime credential implies your opponent is soft on crime and un-American. Bruhn recalls the Fresher Under Pressure tagline created by Wholly Guacamole several years prior to its acquisition by Hormel in 2011. When she tested the term with focus groups, people associated it with “grandma’s pressure cooker” and dismissed it as old fashioned. Superior taste would have been a better message, she says. Before they focus on consumer loyalty, HPP proponents are concentrating on food companies and retailers. 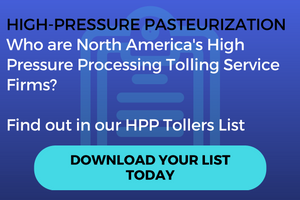 A fall 2017 online survey commissioned by Universal Pure (universalpure.com), a Villa Rica, Ga.-based HPP toller with 11 presses in four locations, concluded that HPP awareness is increasing rapidly. Among 135 respondents, 74 percent of retailers and 77 percent of food companies were familiar with HPP, up from 60 percent in the prior year’s survey. More importantly, they hold highly favorable views of the technology, with 58 percent of food companies saying it is superior in retaining nutrients. “Food safety is almost an expectation,” notes Mark Duffy, Universal’s CEO. Coca-Cola’s Suja cold-pressed juices are beginning to appear with the cold pressure seal. That’s “a great way for consumers to start to understand and ask questions,” he adds, but it is only the opening round in a long-term education and engagement effort. In-store product demonstrations would tell the flavor story, but “that will be up to the brand owners,” Duffy allows. In its first year, council membership more than doubled to 17, including seven food companies, up from three. Duffy’s current foci are persuading store-brand managers to use the technology and emphasizing the formulation advantages and shelf-life extension to food companies. Boosting industry use to critical mass is a necessary first step, but public engagement will determine the technology’s long-term prospects. To be successful, Bruhn cautions against preconceived notions of what is important to consumers. In her irradiation research, she was surprised when focus groups told her they were won over by European acceptance of the technology, for example. Full disclosure is her advice. Most people find comfort in simply knowing more information is available, even if they never make the effort to access it. Attitudes are more flexible than industry often realizes. This video, from Avure Technologies, explains what HPP is and how it's used.